The Tufts Jumbos’ national championship hopes ended on Saturday after it was unceremoniously knocked out by the University of Scranton Royals in the Elite Eight. While the team defeated Messiah College 55–41 on Friday in the Sweet Sixteen, Tufts fell 44–40 to the sectional hosts the next day. This is the second straight year the Jumbos have lost in the Elite Eight, and both defeats came on the same hardwood floor. Junior guard/forward and co-captain Erica DeCandido expressed her disappointment at Tufts’ defeat. Saturday’s game was marked by a mix of tough defense and poor execution on offense from both teams in the first half. Tufts tied its season low of 40 scored points, as both teams struggled to keep the ball and make their open shots. It took a little under four minutes for both teams to finally get on the board; Erica DeCandido made two free throws after Scranton junior guard Makenzie Mason had gotten things underway with a 3-pointer. After the first 10 minutes, both teams combined for a total of 13 points, with the Scranton Royals ahead by just one point. The game eventually opened up in the second quarter, with Tufts sophomore guard/forward Emily Briggs leading all scorers with five points in this period. First-year guard Janette Wadolowski, who made the game-winning basket in Tufts’ victory over Amherst in the NESCAC semifinals, made a buzzer-beating jump shot to put Tufts up 16–15 at the half. While the Royals quickly retook the lead coming out from the break, the Jumbos then went on a 15–2 run to put themselves in a commanding position with a little under four minutes to play in the quarter. Tufts outscored Scranton 19–14 in the third quarter, and for a moment it seemed as if the team was headed back to the Final Four for the fifth time in six years. Ultimately, the story of Saturday’s game found Tufts on the wrong side of a 15–0 run at the end of the fourth quarter, effectively surrendering the game to the hosts. While Tufts had gone on a 7–0 run itself that was split between the final two quarters of regulation, the team was somehow unable to finish the game off despite taking a 40–29 lead with eight minutes to go in the fourth quarter. Junior guard Cailin Harrington had given the Jumbos an 11-point lead and it seemed like Tufts was in the home stretch. However, a series of missed shots and fouls in defensive transition gave the Royals an opening, which they gladly seized. Mason’s 3-point shot with 2:48 to play made it a one-score game at 40–38 before her teammate, junior forward Sofia Recupero, tied the game up with just over two minutes to play. Suddenly, the momentum appeared to have shifted in favor of the hosts, while the visitors struggled to get any offense going. With the team shooting just under 25 percent, the second-lowest for the team this year, DeCandido said that this low conversion rate might have contributed to the team’s lack of success as the momentum flowed towards Scranton. In an attempt to stem the tide, coach Carla Berube took a timeout to try and recapture the momentum for her team. However, fouls given up by Tufts gave Scranton’s senior guard and co-captain Bridgette Mann opportunities to extend their team’s lead, which they took easily. 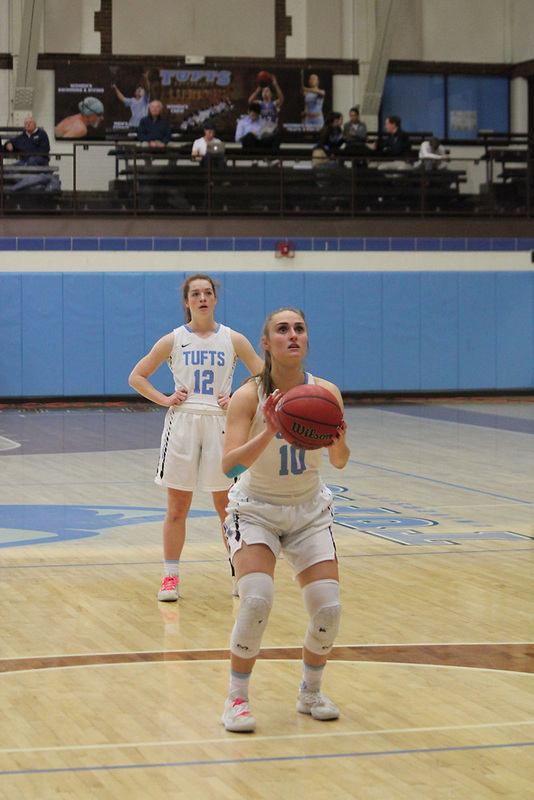 In contrast, Tufts’ offensive struggles continued as 3-point attempts by first-year guard Molly Ryan and senior guard and co-captain Jac Knapp came up empty and the team’s postseason run came to an abrupt end. Berube credited Scranton’s victory to poor offensive execution on Tufts’ end and solid defense on Scranton’s end. A day earlier, Tufts came through a challenging first half against Messiah to eventually win the game by a score of 55–41. In a tight first half, no team could pull away by more than two scores. Tufts entered the locker rooms with a 26–22 lead, after first-year guard Sofia Rosa made two free throws with 15 seconds to play in the half. The highlight of the second quarter was Harrington’s three consecutive 3-pointers, which kept the offensive momentum going for the Jumbos. Tufts emerged from the halftime break with more offensive and defensive efficiency, and subsequently went on a 9–2 run to start the second half. This gave the Jumbos much-needed breathing room. That lead extended to 15 points at the start of the fourth quarter after Harrington made a layup, and Tufts eventually emerged with a 14-point victory. DeCandido finished with a team-high 15 points, with Harrington close behind with 14. On the other side of the ball, Messiah senior guard Maci Thornton kept her team’s hopes alive throughout the game, ultimately finishing with a game-high 20 points. Part of the team’s success was being able to limit Mid-Atlantic Conference Player of the Year senior forward Alecia Rohrer, who usually averages 15 points a game, to just four points. With the loss on Saturday, Tufts concludes a season highlighted by strong performances that led the Jumbos to a 28–3 record and a NESCAC championship on Feb. 24. Their 28 wins mark the Jumbos’ fourth-most wins in a season in program history. Looking back at the 2018—2019 campaign, Knapp believes the season was still a good one. The program graduates just two seniors in Knapp and forward Katie Martensen.